There are many ways of becoming a Chartered Environmentalist through a diverse array of “environmental” Institutions all licensed to award CEnv by the Society for the Environment. This is a guide through one of the application process’ via the Chartered Institution of Water and Environmental Management (CIWEM). The e-book is a very easy read and it is a cross between a manual and a self-help guide. At the same time Rupert’s enthusiasm for the environmental profession shines through. For those people who may not have colleagues who have gone through the CEnv process this is an ideal overview to accompany the application Guides that the respective Institutes and Institutions provide. I reviewed this publication on the Kindle and whilst the book was presented well, the small text on the diagrams and some of the tables was virtually unreadable. This is not a criticism of the author but of the way diagrams are loaded as pictures and then cannot be made bigger like in an I-Pad application. Rupert has identified this issue and does reference them so that a reader can overcome this by accessing various websites. 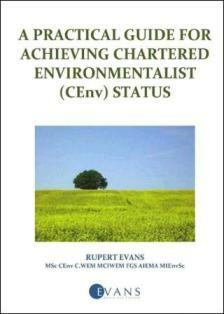 In conclusion; excellent essential reading for the would-be CEnv – via any application route.